Extremely fine filtration: 0.01 micron. Silver-coated activated carbon with Tourmaline and Coral Calcium. NEW Ultrafine Biostone Water Filter fits all our Jupiter water ionizers (except Regenesis 2000, Regency II, Orion, Aquarius and Vesta). This Biostone filter represents the state of the art in water filtration today. Hollow fiber filtration –the same technology used in kidney dialysis — removes the finest particles, down to 0.01 microns. This is the finest domestic filter available. We recommend this filter for well-water, where there are hyper-allergenic issues, and in all cases where there are concerns about contamination. Silver-coated activated carbon that removes harmful chlorine, trihalomethanes, phenols, sediment, odor, sour taste, organic waste, lead, pesticides, and bacteria of all kinds. Coral Calcium. For years, this substance has been prized in Japan and the Philippines for its healing properties. It also adds calcium, magnesium and trace minerals to the water. Their health benefits are well established. And, if your water source is low in minerals (e.g. tank water), these minerals will assist the ionization process. Furthermore, it reduces harmful levels of sodium fluoride. 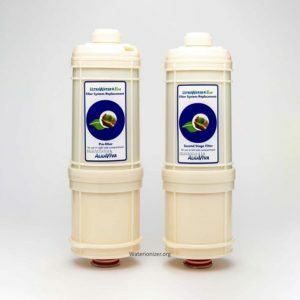 Because of the fineness of filtration, the lifespan is 5-7 months for the Ultrafine filter, compared to 8-12 months for the standard Biostone water filter. Longevity will depend on your water source and frequency of use. For example, if the chlorine level of your tap water is between 0.4 and 1.0 ppm (parts per million), this can extend the life of the water filter by 50%. Not sure which filter to choose? View our Filter Fit Guide at the bottom of this page. Ultrafine filter The 0.01~0.001 super-minute porous structured filter system has a selective filtering function: lets mineral pass but easily eliminates viruses, bacteria, and corpuscles. To get a fun, interactive look at JUST HOW FINE 0.01-micron filtration is, go here and play with the sliding scale. Silver Coated Active Carbon The filtering function uses active carbon–carbon created by burning palm trees at high temperature. This is a secondary pollution-prevention function. Special textile filter This filter contains a triple textile filter, so no need to worry about germ propagation. Specifications and Certifications – Click here.